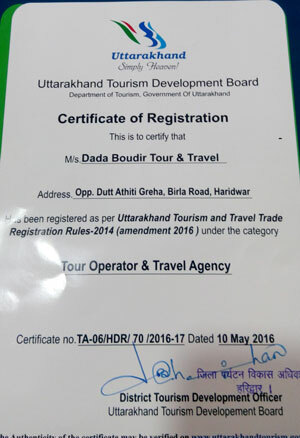 We Dada Boudir tour & Travels in Haridwar has been Govt Approved Tour and Travel agency in Haridwar. Travelers who has visited Chardham yatra with us. We are the best travel agent in providing Chardham yatra tour packages in Haridwar. We Dada Boudir tour & Travels in Haridwar has been Govt Approved Tour and Travel agency in Haridwar. Travelers who has visited Chardham yatra with us. We are the best travel agent in Chardham yatra. Many pilgrimages from across the world has witness our best chardham yatra tour packages and our services offered to them during the chardham yatra. Chardham yatra tour packages will include all boarding and lodging of the customer & there will be no hidden cost include in the Chardham yatra tour package.